Where in the world is Beaux Arts Village? The Town is located conveniently near both Interstate 90 and Interstate 405 and sits at longitude W122º12'7" and latitude N47º35'9" in King County, Washington. 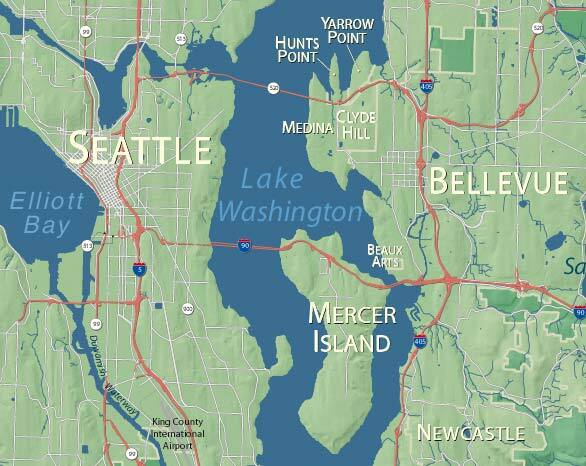 Downtown Bellevue is about 3 miles north and Downtown Seattle is less than 10 miles west. The Town of Beaux Arts Village uses a mayor-council form of government. The Mayor and members of the Council are volunteers elected by citizens of the Town. Council meetings are held on the second Tuesday of the month. The Town contracts for police services with the King County Sheriff's Office and for fire-protection services with the City of Bellevue. If you have a life-threatening emergency, please dial 911 immediately. The Town of Beaux Arts Village has no Town Hall. Meetings of the Town Council and Planning Commission are held in members' homes and are open to the public. The Town employs two part-time clerks who manage the day-to-day operations of the Town from offices they maintain in their homes. Clerk-Treasurer Sue Ann Spens handles all issues before the Town Council, answers questions about general Town and Water Department business, manages all financial records and reporting, and is the person you will likely speak with when you call the Town's telephone number. She can be reached by email at townhall@beauxarts-wa.gov or by phone at (425) 454-8580. Deputy Clerk Angela Kulp handles all aspects of the Building Department, including permits and variances, and all issues before the Planning Commission and the Hearing Examiner. She can be reached by email at bldgdept@beauxarts-wa.gov or by phone at (425) 269-6985. The Town contracts with qualified professionals for building-official, inspection, code-enforcement, planning, arborist, and public-works services. Each of our contract staff members charges for their time. If they perform work for individual residents, their time will be billed to the resident for whom the work was performed, usually in conjunction with a permit. The Beaux Arts Water Department provides water to residents of the Town from a deep artesian well. Because this water is not treated with chlorine, the Town arranges for periodic testing as prescribed by the Washington State Department of Health to ensure its safety. No fluoride is added to the water either, so parents should consult with their pediatrician or dentist about fluoride supplements for their children. The City of Bellevue Sewer District provides sewer services. CenturyLink provides landline telephone service. Wireless telephone service is provided by a number of carriers, including Verizon, AT&T, and T-Mobile. Republic Services collects garbage, yard waste, and recyclable waste. Puget Sound Energy provides electricity and natural gas. Comcast offers cable TV and high-speed internet connections. In addition, there are other subscription TV service providers in the area, including Direct TV and DISH Network as well as other options for internet service. The Town of Beaux Arts Village is part of Bellevue School District No. 405 and is served primarily by Enatai Elementary, Chinook Middle School, and Bellevue High School. All property owners in the Town are members of the Western Academy of Beaux Arts (WABA). WABA owns and maintains 1,100 feet of Lake Washington waterfront on the western edge of Town for the sole enjoyment of its members and their guests. This private beach serves as the main park-like area within the Town's boundaries. WABA also owns and maintains boat-moorage facilities on this property. For more information, please visit WABA's website at www.waba1908.com. The Town of Beaux Arts Village distributes a monthly bulletin to residents with information and general announcements that are of direct benefit to residents.